Most of the coast of Honduras faces to the north. Fly north out of San Pedro Sula and you might land in New Orleans. Tegucigulpa is the largest city in Honduras. Hondurans like to joke that their second largest city is not San Pedro Sula but New Orleans. Twenty miles off the coast of Honduras are the Islas de la Bahias, the three Bay Islands, Guanaja, Utila and Roatan. Here you will find world class scuba diving opportunities along a stretch of the second largest barrier reef on the planet. You will also find world class fishing and a society of islanders living somewhere between primitive 1930 and the cyber-wacky 21st century. At the crack of dawn the four of us took Continental to Houston, then to Roatan: John and Barb, Chris and myself. 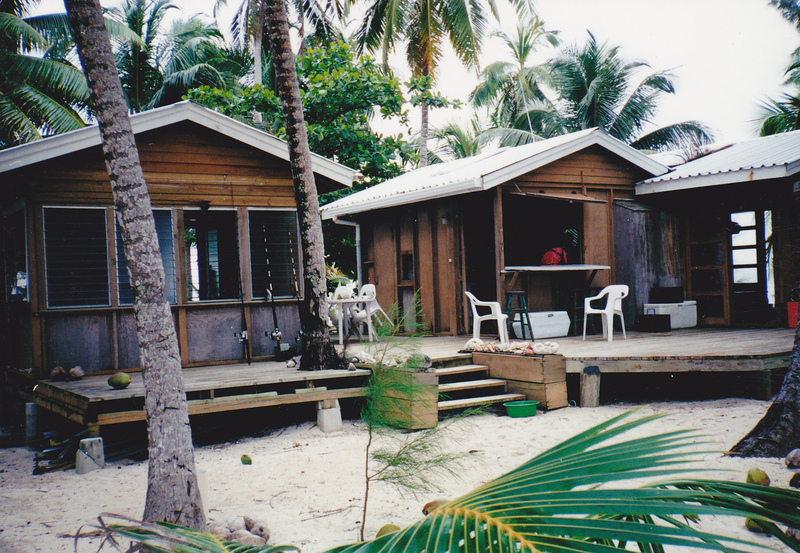 John and Barb have been visiting Utila annually for twenty years. Their house on Joe Point was completed in 2005. Thanks to John and Barb, Chris caught Utila fever. Her house was completed in 2009. All the houses on Joe Point are built ten feet up, on cylindrical concrete pilings. All the houses have floor-to-ceiling louvered windows, fine-mesh screens, and that laid back Key West feel. The van sent by Foster’s West Shore delivered us to Mr. Foster’s low-key bungalow hotel on the beach. We took a late afternoon dip in the warm saltwater. We spent cocktail hour at a table in Foster’s large open-air bar & restaurant, its many ceiling fans slowly circulating. At dusk we took a water taxi to the Half Moon. An old man and his 10-year-old grandson transported us in an open longboat, the 20-to-40-foot traditional water craft the Hondurans call a panga. We dined on grouper and I fell in love with conch ceviche. My beer of choice quickly became Port Royal. In Honduras the rum of choice is Flor de Cana. At 10 p.m. Chris and I entered our room and found it as refrigerated as a walk-in cooler. In the bathroom a small crab scratched at the slick sides of the huge pink fiberglass tub. I carried the crab in a coffee cup to the relative sanity and justice of the great outdoors. Indeed, it’s whom you know. Barb is good friends with flight nurse Cindy Peterkin. Barb ran into Cindy last night during cocktail hour at the bar at Foster’s. Today at 1 p.m. at the airport, we boarded the red Medivac helicopter piloted by Ron Shortis, Aussie and Vietnam vet. In the Russian-made Sikorsky S62A, we flew to Utila at 120 knots at 750 feet. We landed on a flat of broken coral in ten inches of water just off Pigeon Key. Fifty children and adults smiled and cheered. The older children carried our luggage to shore. In his fiberglass panga Carlos, the caretaker of the Joe Point properties, took us north across the reef to Chris’s dock, then to John and Barb’s dock. Anna, the housekeeper for Joe Point, and her fisherman husband Noel, had stocked both houses with fresh vegetables, beer and albacore tuna steaks. We four dined on sashimi at John and Barb’s, sitting on wicker stools at the long black granite breakfast counter, the green parrot Paco looking on and protesting. I met Carlos’s large black friendly dog Duque (DOO-kay) who visited all the properties on a daily basis. Pelicans and frigate birds drifted over the crystal clear water. The Bay Islanders are not Catholic. They are a mix of Cayman, Carib and the offspring of African slaves and of English privateers and buccaneers. They are Methodists, Baptists and 7th Day Adventists. Both hardware stores in Utila Town are owned by 7th Day Adventists and thus they are closed on Saturdays. During my morning snorkeling exploration east of the dock, I discovered, alone in the sand in eight feet of water, a huge bulldozer engine, an impromptu reef housing lobsters, black prickly urchins, anemones and scores of colorful fish. This afternoon Chris and I took the kayaks out and followed the beach and jungle coast to the west. The First World, represented by the upscale dwellings on Joe Point, quickly segued to the Third World, a channel that took us past an open-air shack, a rotting fishing boat strung up between four rotting dock pilings, and way back in, where the channel quickly narrows, we found the Utila Island landfill, and it was appalling. The poorest of the poor live around the landfill. They move silently through the jungle, freely crossing the Joe Point properties, carrying burlap sacks filled with wriggling blue crabs. Not once did even one of the poor look my way. The swarthy among them are almost invisible. Norman (30) is a native of Pigeon Key, a quarter mile long, 100 yards wide, and just a few minutes by boat from Joe Point. Houses and docks, a church and a school fill every inch of Pigeon Key. Many fishermen live here. Norman has three youngsters under seven and a hard-case wife. He’s a fishing guide. He says can’t wait until he’s 70. Pigeon Key parents name their kids Elvis I and Elvis II, Roy Rogers, Pat Boone. George Jackson’s two dogs are named Rambo and Obama. George, a pirate at heart, built all the beach houses on Joe Point. Utopia Resort, a mile east of Joe Point, is owned by Kyle (40) and Deb (48), two women from Kansas and Austin. They hosted an afternoon party, open-air cash bar, free burgers and pulled pork sandwiches. Chris informed me that I was among ex-pats, renegades, and the lovers of the magic in a magical land. The instant camaraderie with two dozen adventurous Americans was as good a way as I know to celebrate the Fourth of July. All of these people have a long-standing love affair with Latin America, the Caribbean islands and the Gulf of Mexico. All are boat people. John and I headed out in dark at 4 a.m. with Rex, Pigeon Key fisherman, on his 37-foot fiberglass panga. Over calm water we headed east past Utila Town, into Pumpkin Hill Bay and out onto the open sea. The moon was a chubby crescent, an ark among the stars. We were fishing for albacore, trolling the tuna boils, activity visible on the surface as the tuna fed at the crack of dawn. A shark showed its fin and disappeared. Flying fish flew right past our faces. We each caught six 6-pound tuna, more sashimi for us, more bait for the fishermen. Rex fished with a hand line, with duct tape around his fingers to protect his flesh. Early in the hunt a monster hit my line and pulled out 300 yards of 30-pound-test. I held the rod while John tightened the drag as far as he could. Rex turned the panga and began the chase, but the big yellowfin broke off and escaped. On Pigeon Key, the four of us ate breakfast at the Harbor House. We shopped for groceries at Chisui´s store. Chisui´s mom chose that name so her husband would never forget his affair with a Thai lover named Chisui. A young girl sat on a stool behind Chisui and watched “Sponge Bob” on a small color TV. I wandered the two short aisles while Chris exchanged American dollars for Honduran lempira. Chisui was well stocked with beer and rum. It was a blustery morning. A squadron of dragonflies acted like a windsock facing straight into the warm wind, a hover pattern. The rain came down at noon and didn’t let up until cocktail hour. Throughout the gray indoor day, Chris and I finished our novels, did a load of laundry, I installed a new blind on the back door and we made a salad. Chris and I have known each other for forty years. We’ve been through a number of stages of the man/woman relationship. After much distillation, we have settled on the big three: we know how to live together, we know how to party together, and we know how to travel together. After a lazy morning reading on the screened porch, Chris and I kayaked to a nearby reef and snorkeled. A cuddlefish hovered and allowed me to get close, eye to eye, yet another personal moment when I can declare that this is exactly how life should be. At two o’clock Norman transported us in his uncle’s boat ‘Sea Hunt’ to Utila Town where I reserved a room at the Mango and bought my Sosa Airlines plane ticket to La Ceiba and San Pedro Sula. We bought groceries at Denny´s, and then boated back to Pigeon Key for fish cakes and breadfruit at the Jackson house, and FIFA soccer on TV, Germany v. Uruguay. I am indifferent to soccer, but I do enjoy championship sporting events of all kinds, even curling. Chris and I shared the dining room table with the Jacksons, and with a Costa Rican husband and wife and their two confident daughters, both on break from college in Paris. They were renting the lone house on tiny Sandy Key. There was some small talk among us, but mostly we allowed the game to unite us. While John and Barb drank beer with the Costa Rican family, Chris and I found even more startling snorkeling off Sandy Key, a reef wall in crystal clear water. In the maze of brain, pipe and leaf coral upheavals, a school of fifty blue tang passed and nearly grazed us. We saw parrot fish, butterflyfish, the lesser electric ray, the sharptail eel; and twenty feet further out, the sea dropped off into the depths. Straight down. Fade to black. We four took John and Barb’s boat, the ‘Water Bird,’ across the bay to a picnic table lunch at the Purple Pelican. John and Barb call the place the Purple Skeleton because the service is slow. A dive boat followed us in. Ah, youth! It was an international bunch in baggies and bikinis. Twenty-somethings come here from all over the world to scuba dive at a fair price. I’m not kidding about the fresh fish factor (FFF) off the coast of Honduras. Last night: grilled rockfish. This afternoon: albacore steaks served hamburger style. Tonight, thanks to the fishing prowess of the true pro, Rex, we ate barracuda steaks for dinner. Gastronomic breakthrough: Thanks to the Utila experience, I will never forget the meaning of fresh fish. John, Barb and Chris dropped me off at the dock of the Driftwood Cafe in Utila Town. I had opted to stay for two weeks. John and Barb and Chris always stay for two months. In room 108 at the Mango, I turned on the bedside light at 4:15 a.m. I showered, dressed and repacked my small red duffel bag. The downpour began at 4:30 and it didn’t let up for an hour. At 5:30 I was soaked and standing on the covered porch of the Mango’s front office waiting for Hank and his van to take me to the airstrip. The rain let up at six. By 6:15 I was in my seat on the right side of a 12-passenger two-prop Sosa Airlines puddle-jumper. By 6:30 we were in the air and I got my last view of Joe Point and Pigeon Key. It was a twenty-minute flight to La Ceiba on the mainland, thirty minutes to San Pedro Sula, then Houston, Albuquerque and home. This trip was pure immersion. Daily I was baptized in the waters of another world. There is a life-affirming soothing eroticism involved when living in a bathing suit and sleeping naked on top of the sheets. Greg Leichner won the First Annual (1995) Rocky Mountain Artists/Eccentric Book Competition for his 15-postcard series “Citizens For A Poodle-Free Montana.” His personal essays and editorial cartoons have appeared in numerous literary reviews and regional publications.